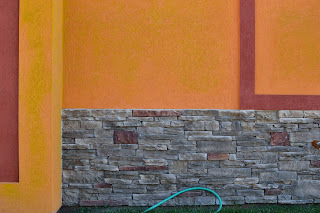 This week's photo background: The bright orange wall in this week's shot is from a local Mexican restaurant, La Fuente's and as I said before, it was very appropriate for the weather we've had this past week. 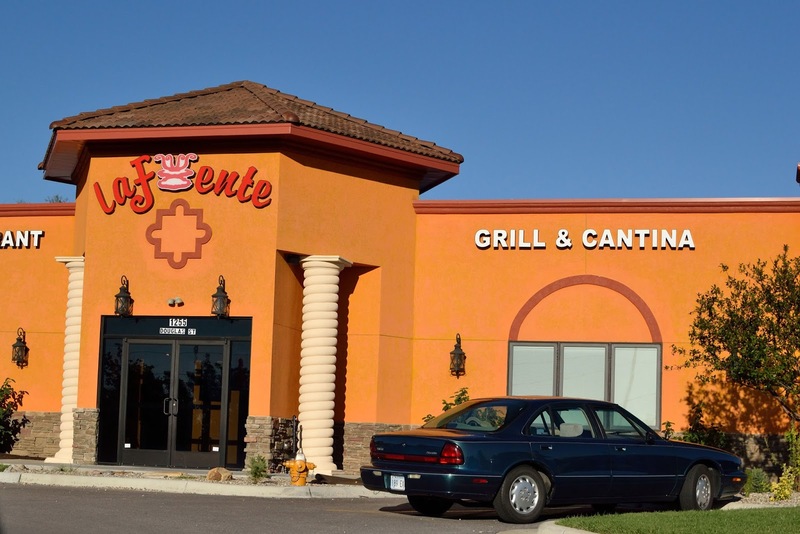 This restaurant used to be one of Brandon and I's favorite, but since cutting out GMO's from my diet, I'm afraid I can't eat here anymore. ) : Mainly because their use of conventional corn and oil in the chips and tortillas, which I'm pretty sure won't get switched to organic anytime soon. No wonder I always had a stomach ache after eating here, even when I made sure everything I ate was gluten-free! 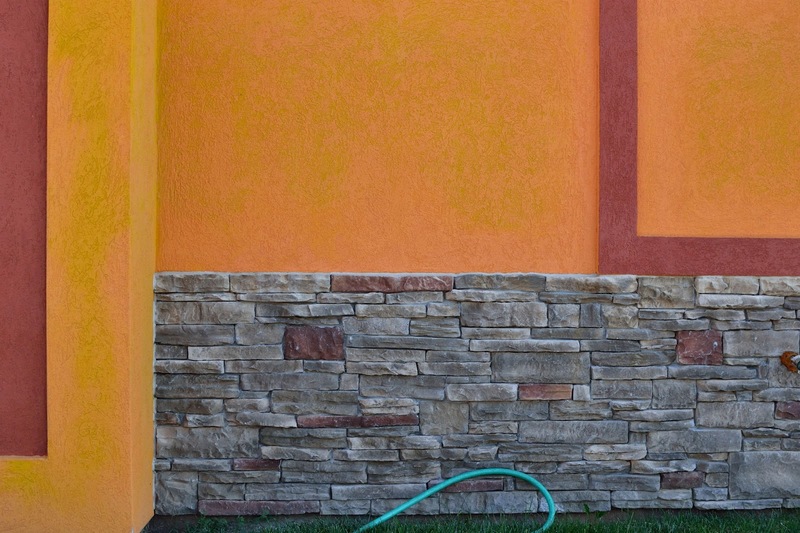 In the meantime I'll just use their lovely orange wall for my pictures, and save the Mexican cuisine for my own kitchen. I wasn't the only one feeling the heat this week, check out the red cheeks Avery was rocking after playing outside one afternoon! Don't worry we make sure she has plenty to drink, and we head inside if she starts to get too hot. But she doesn't seem to mind it one bit and would be perfectly content to play outside...in the heat...all day if we let her. Like that outfit? 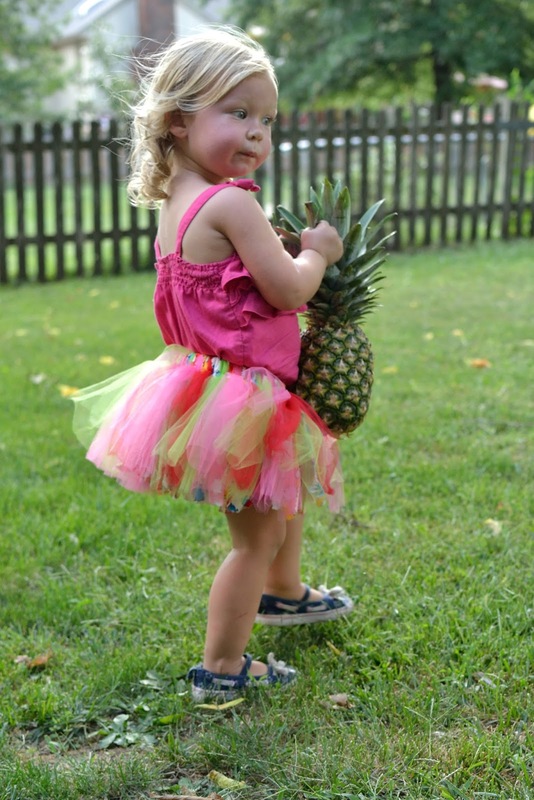 She picked it out all by herself, and in fact she is pretty notorious for wanting to dress up in tutus and dresses ONLY when going outside to play! As for the food size this week, I can't believe how big they are getting! 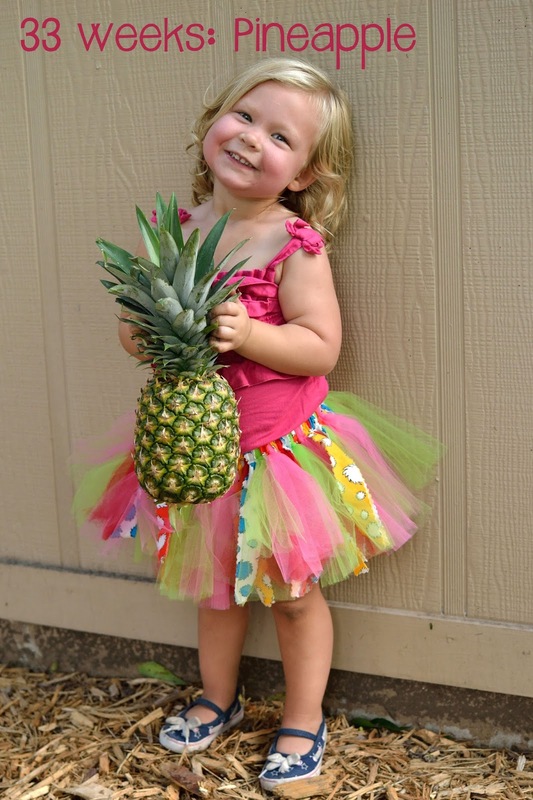 A pineapple makes it seem pretty real that the end is coming near, but based on my own observations of my belly, I'm pretty sure the pineapple size is right on with Mila's current size. Best part of picture time with Avery was once I got the shot of her holding the pineapple she asked, "I go throw her now?" as she's done in so many weeks prior. 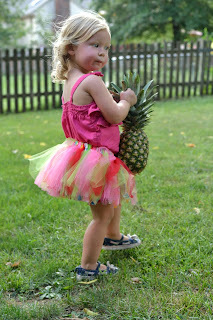 There seems to always be a trend with these pregnancy cravings and this week is no different. The trend: creamy dips. First up is "Nacho Mmmm Sauce" from Peas and Thank You. 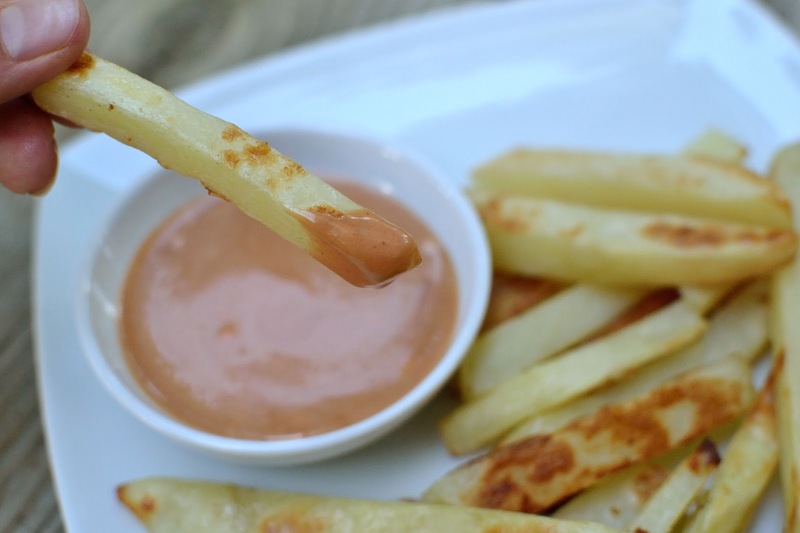 It's creamy, spicy, and perfect for dipping chips. Ingredients include: chickpeas, almonds, nutritional yeast, salsa, water, lemon juice, garlic, chili powder, cumin, and cilantro. Mmmm is right! The creamy dip trend continues with "Creamy Ketchup" something I had no idea has quite the following it does. 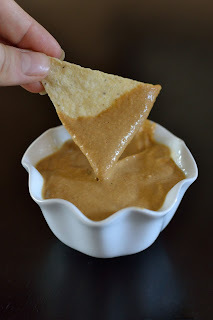 For years I've watched my husband mix Mayonnaise and ketchup together to make a dipping sauce for his fries or burgers, but I've always thought it was a bit gross...since I'm a huge plain ketchup fan. But since going vegan, he switched to Vegenaise and one day when we were gearing up for our dinner of veggie burgers and homemade fries, I gave it a try and oh my gosh it was good! Homemade fries with "Creamy Ketchup"
Now I'm hooked too, and seem to only be able to eat my fries and veggie burgers when they are dipped with the simple combination of Vegenaise and organic ketchup (in equal portions in case you're wondering...so 2 Tbs Vegenaise + 2 Tbs ketchup, etc.). I've seen it called all kind of names from "Dipping Sauce" to "Creamy Ketchup" as we call it, any other fans out there? If so, what do you call it? My favorite moment of the week is actually a favorite time of the day. Most nights after putting Avery to bed, Brandon and I crash on the couch to watch our favorite shows we've saved on our DVR, but the part that makes it my favorite is when Mila joins the fun and starts kicking and moving like CRAZY! In the earlier weeks I noted that I was able to feel them often, but Brandon or Avery weren't able to ever really catch them. Well, things are a bit different now and Mila sure knows how to make herself known! We'll just be watching away and then all the sudden she'll start moving and bending and stretching in what feels like she's literally trying to find a way out of my belly button or something and the best part is the look on Brandon's face! I'm sure it helps that I'm finally sitting down to relax after a long day, but I like to think that she knows it's her Dad that's hanging out right next to her and she wants to tell him HI! Brandon feeling the "Mila gymnastics" one afternoon.